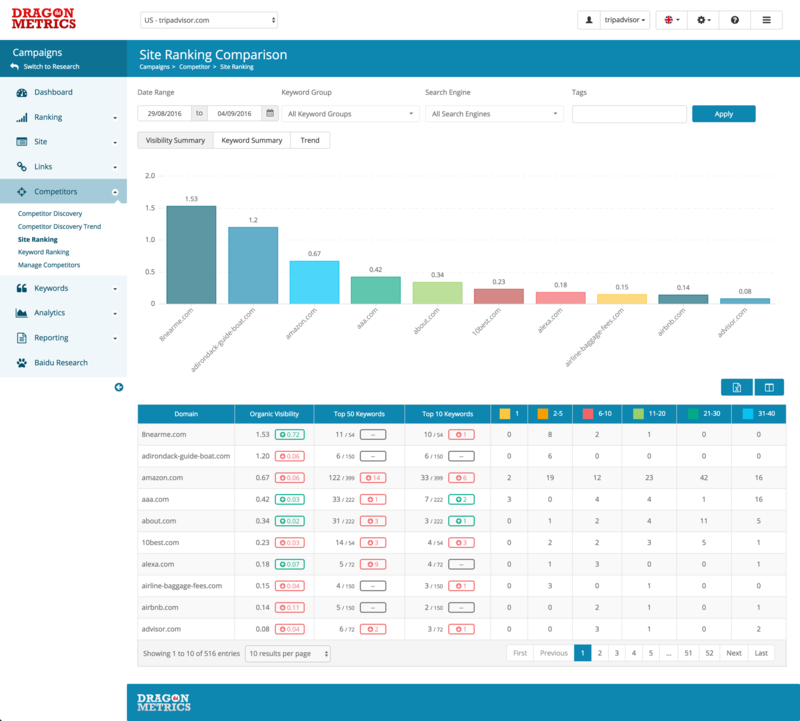 The Site Ranking Comparison page allows you to compare site ranking performance between your site and all your tracked competitors' sites, you can segment your data by Date, Keyword Groups, Search Engines, Top Ranking URLs or All Ranking URLs and Tags to get performance data only for the keywords that you looking to analyze. Note: Unlike Competitor Discovery or Competitor Discovery Trend, The Site Ranking Comparison page is specifically designed to show data only your tracked competitors, you can learn more about adding tracked competitors to your keyword group here. You can segment your keyword data in a numerous ways with filters located at the top of the page. Date - You can select a specific date range to look up for ranking data, please keep in mind that the day you've chosen here will be respective to your account's ranking update frequency, for example in weekly accounts, the data being presented for any specific day will be the same across the same week. After you've set the criteria of keywords, click on Apply and the page will be refreshed with data matching your criteria. Bar chart that shows Organic Visibility of competitors with yours in the most recent updated day of your selected date range. Stacked bar chart showing you most recent keyword ranking performance of each site. X axis is the site and Y axis is the number of ranking keywords. You can also see each bars in the chart contains multiple colors, that's because we've stacked ranking keywords in different ranking positions together to form each bar in the chart, hover over each colored part of a bar will show you the positions, ranking keywords of that domain. Trend chart shows you Organic Visibility of you and your competitors over time. Top 50 Keywords - Number of top 50 ranking keywords for the domain. The numerator is the number of top 50 ranking keywords and the denominator is the total number of tracked keywords. Their changes compare with start date are also shown. Top 10 Keywords - Number of top 10 ranking keywords for the domain. The numerator is the number of top 10 ranking keywords and the denominator is the total number of tracked keywords. Their changes compare with start date are also shown.